This Skinny Alfredo Sauce has all the flavor of regular alfredo, but with a fraction of the calories and fat! A few simple swaps help to keep its rich taste, without overindulging. 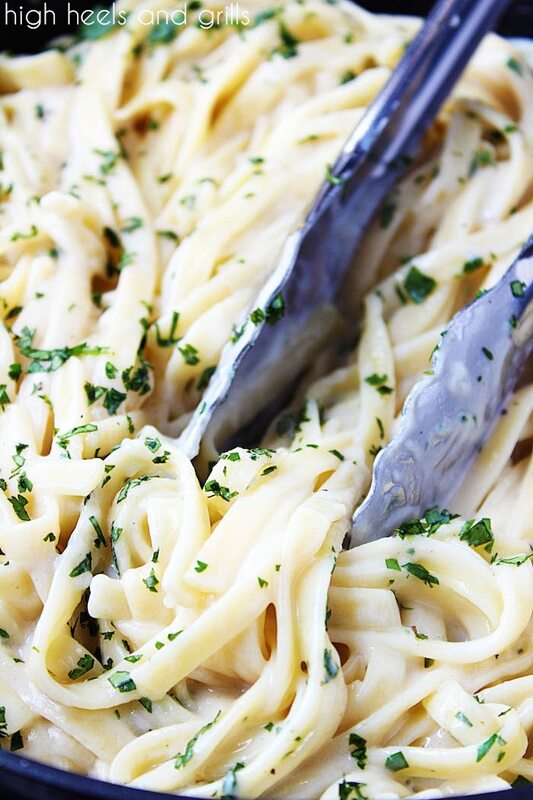 This Skinny Alfredo Sauce and noodles has seriously become one of my favorite dinners. That’s not even mentioning the fact that it’s a low calorie dinner. I’m talking about how it’s in the competition with regular meals that have full fat and full calories, it’s that good! It helps that it’s really easy to make, too. 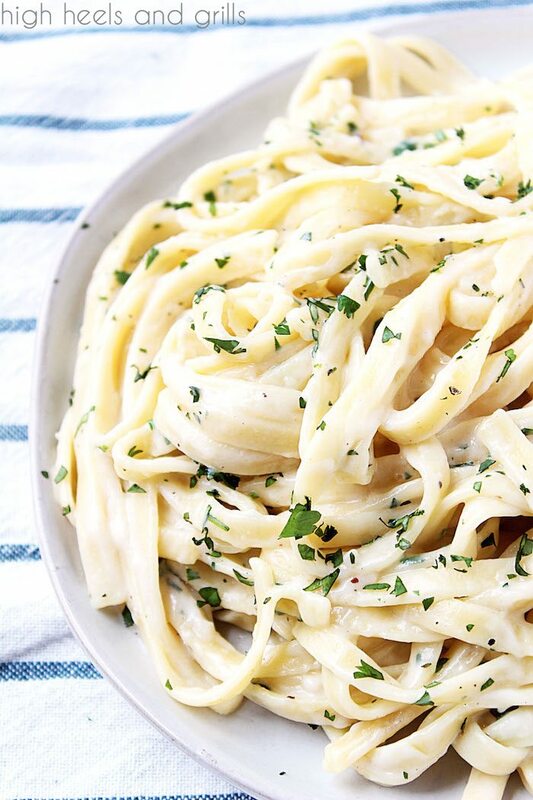 Zach and I have visited the old Olive Garden more than a few times in our marriage and because I’m lame and don’t like to branch out, I get the same thing every time – Fettuccine Alfredo. I know, so basic. But it never lets me down! The only downside to that plate of goodness is how gross I feel when I heat up the leftovers the next day and it looks like my noodles are swimming in a cup of butter and oil. Yuck. I haven’t always been good at being calorie-conscious and watching what I eat, but with this Skinny Alfredo Sauce, I love that I don’t have to be very analytical of what I’m eating when I’m trying to be healthy. It does the work for me. Just swapping out cream for milk already does wonders! Don’t knock it until you try it. 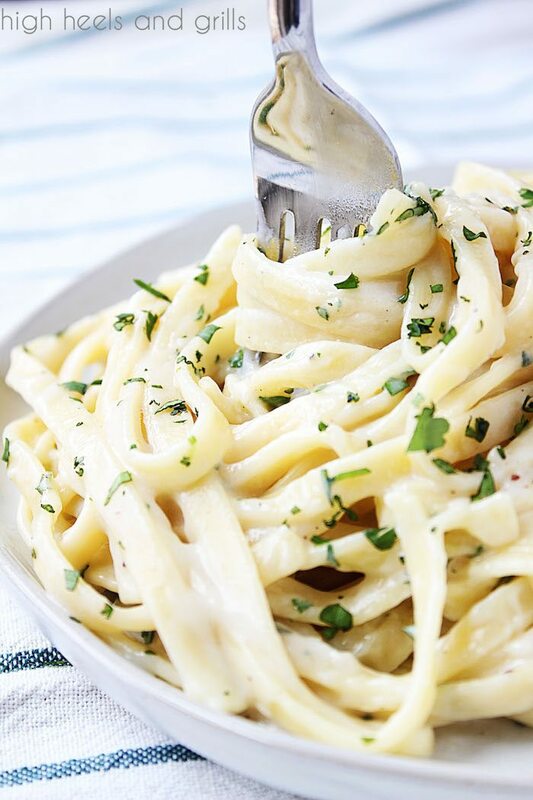 I think you’ll be pleasantly surprised by how much flavor there is in this Skinny Alfredo Sauce, especially considering it is a healthier option! Meanwhile, heat olive oil over medium-low heat in a large saucepan. Add garlic and saute until golden brown. Whisk in the milk, chicken broth, 3 Tbsp. flour, salt, and pepper to the saucepan and cook over medium-high heat, stirring continuously until the sauce thickens. Add the last Tbsp. of flour, if needed for additional thickness. Whisk in the Parmesan cheese. When the sauce is to your desired thickness, pour over and toss with the noodles. 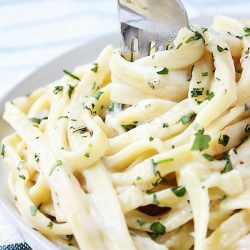 I always have a hard time finding a good alfredo recipe! This sounds good! And the fact it is healthy is awesome! How fabulous that this is a low-fat version! I love alfredo pasta! Skinny means I can have it every day of the week, right?! Sshhh… don’t answer, I’ll just go ahead and put it on my meal plan! I just used good ol’ Swanson. Has that brand worked for you? Or is it one of the ones that you’ve found to be oily? I just made this for dinner! It was delicious!!!! I like alfredo sauce but it is usually so thick. This was perfect! I added broccoli and grilled chicken!! So yummy!! Sarah! (Awesome name by the way 😉 ) You have no idea how happy reading this made me! I am so glad to hear that you liked it. It’s hard trying to tell people that things taste good because they may taste good to me, but everyone else may think otherwise, so thank you SO much for letting me know how it was for ya! I’m definitely going to try the broccoli and grilled chicken. Sounds delish! Thanks for stopping by. Hope you have a fab day!! This recipe really does taste so good! Thank you!